Saying the federal government had committed to funding the mission, Gov. 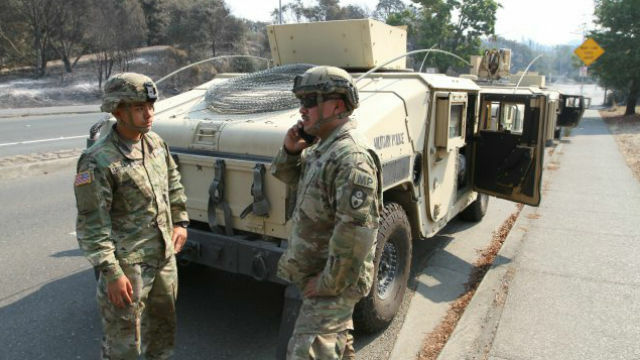 Jerry Brown Wednesday mobilized up to 400 National Guard troops in response to President Donald Trump’s call for an increased presence along the Mexico border, but Brown insisted they won’t be enforcing immigration laws. Brown’s official order was issued following a week of questions about how the troops would be deployed, whether any of them would be actually sent to the border and whether the Trump administration would still fund them. Brown announced last week he would deploy the troops, but said they would be stationed “statewide” as part of an ongoing effort to “combat transnational crime,” and they would not be enforcing federal immigration laws. “California Guard service members shall not participate in the construction of any new border barrier,” according to the order. California was the last state to respond to Trump’s call for National Guard troops at the border. Republican governors in the border states of Texas, Arizona and New Mexico have already deployed a combined 1,600 National Guard troops to the Mexican border.